March 30, 2016, ©. Leeham Co: Airbus has changed the A350-900 website data to now show the 280t Max Take-Off Weight (MTOW) as the standard MTOW. This weight variant was only reserved for the A350-900ULR before, but is not available for customers buying a standard A350-900 as of 2020. Three years after the rollout in May 2013 (photo), after ground and flight tests, the company can raise the MTOW of the aircraft to regain range that was gradually lost during the development of the aircraft, even adding range on top of what was originally promised. 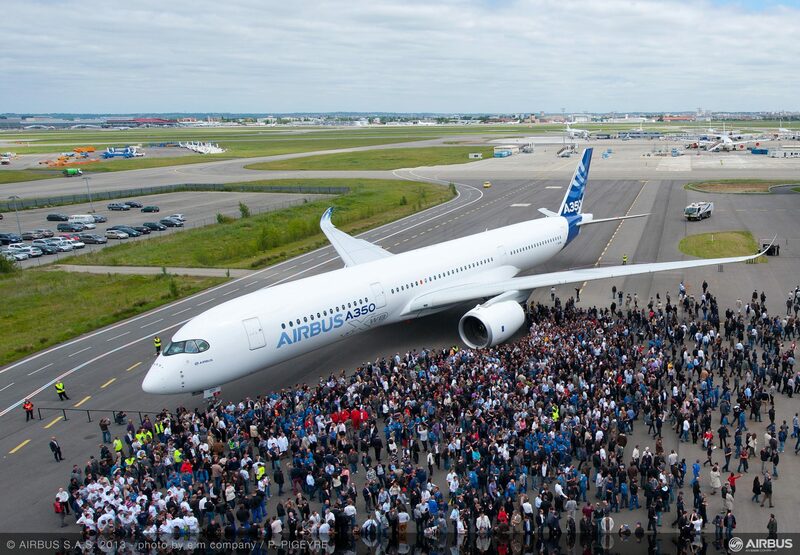 The Airbus A350 was designed to fly 315 passengers in a three class layout 8,100nm. During development, the project experienced weight creep, albeit at a moderate 3.3t (t for the metric tonne) on an MEW level (which is the weight of the aircraft without cabin). About a year ahead of certification, Airbus presentations started to show normal range below 8,000nm. The original range figure was for the original 268t MTOW which was the initial weight variant for the aircraft. At certification of the A350-900 in 2014, three additional weight variants were defined; 260t, 272t and 275t. At the time, Airbus then showed the aircraft as flying 7,750nm with 315 passengers, now in a two class layout. As of May 2015, the three class layout was reintroduced but now with lie-flat reverse herringbone business class seats at 42-inch pitch, a premium economy cabin at 38-inch pitch paired with an economy cabin at 31-inch pitch. Together with the new aft galley layout from the A350-1000 (with lavatories at the side), this gave a 325 seat capacity and a 7,600nm range. The weight variant was not clear for this range figure. During spring and summer 2015, Airbus was competing to fill Singapore Airlines’ need for non-stop flights to the US. Testing of the A350-900 had shown that there were additional margins in the design, aerodynamically and for MTOW, on top of the 275t that was included in the certification. A 280t variant in a special configuration to lower the passenger payload to around 170 passengers could fulfill the most daunting mission that Singapore Airlines wanted to fly, Singapore-New York direct. To reliably fly this mission, which could stretch to up to 19 hours worst case, the aircraft had to be equipped with adjusted fuel cut-off probes in the tanks, to reach a total fuel load of 165,000 litres (standard is 141,000l). With these changes, the variant was called A350-900ULR. Incorporated in the variant were aerodynamic and engine improvements totaling 2%. Since the Singapore Airlines order, several customers have demanded that the extra capability of the A350-900ULR should be available, but in a flexible form. Not all needed the extra fuel capacity; they fly missions with normal loads for which the standard 141,000l is enough. At the same time, they needed a higher MTOW. Philippine Airlines needed 278t to fly their missions. To respond to customer demands Airbus decided that as of 2020, when the aerodynamic improvements of 1% (mainly changes to fairings) and a Rolls-Royce engine PIP (Product Improvement Package) of 1% will be available, the weight variants that can be ordered will include the 280t variant. Additionally, the special fuel configuration of the A350-900ULR will be available, as will a 260t regional variant. In all cases the different weight variants are paper changes to an identical airframe making later in-service weight variant changes possible. So why would an airline change to a different weight variant later in the aircraft’s life? Aircraft price and underway navigation and landing fees are based on the aircraft’s MTOW. To buy just the weight variant necessary to do the job is a way to save operational costs for the airlines. If operational conditions later change, it is a bonus to be able to adapt the aircraft. A Good Morning .. from rainy Germany. Are there any changes to MZFW in context of the bouquet of MTOW options? The 350 seems to steadily develop into an more and more capable aircraft as time goes. This 280t/ulr version must be a very hard competititor to especially the 777-8X. And the 350-1000 stretch that is under consideration might become a very real threat to the 777-9X. I have for some time been thinking that Boeing have done an error with the 777X in that they keept the metal fuselage insted of developing an all new 10 abreast all composite aircraft to supersede the 777-300ER and compete with the high range of the 350, and the 380. If what someone seems to think is true, that Airbus can launch an about 320t stretched version of the 350-1000 with very close to the capacity of the 777-9X and only slightly less range, then I will dare to predict that the 777X family will not receive much more orders than it already have received and turn out to be a large commercial failure not much better than the 340-500/600. From a production standpoint, there’s one important difference with the A345/A356 vs. the 777X — and even the 747-8 — and that is that the former were produced on basically the same production lines as that of the high volume A330. That’s something the 777X won’t have the luxury of having if sales go south. I agree also. Loving the a350 right now in terms of it’s [and airbus’s] quick ability to expand and adapt it for various route combo’s… Airbus need to get cracking though and get those machines out of the factory. Yes , I agree with you. I think Boeing made a big problem by introducing a metal fuselage instead of developing an all new composite aircraft for B777-9 / 8 X family. I am sure that A350-1000 / 1100 will have tendency at later stage to beat B777-X family members easily. It won’t be 165000l of fuel, it will be 156000l of fuel for a full load of 325 passenges, otherwise the numbers don’t add up. I think the 1000 will go the same way, up from 308t to 319t – the stretch – with 165000l of fuel or more. I wonder what the range will be? I also think they will build the stretch – it’s all there to do it! The evolution of the 359 is a fascinating story. One question: Are Singapore Airlines now wanting a 270-seat cabin for the New York route? Or is that a typo? (Earlier stories had them planning a 170-seat cabin for the 350-900ULR). Hi Vms, thanks, a typo which is fixed. What is exactly would be the range of the ULR? So even though it can fly Newark to Singapore non-stop with the 270, Singapore is is out fitting with only 170? Boy-o-boy-o boy. I think the 777-X and the 787-9 just got stabbed. Expect 787-9 and 787-10 ER’s. Expect some 777-8 to A350 swaps. 777X and 787-9 got stabbed? Wishful thinking there. I expect nothing less from the majority of posters on this site. Do you seriously think that Airbus didn’t communicate this to airlines WELL IN ADVANCE of a media release? That simply, one day, like, yesterday, they magically came up with these projections and decided to release it? Come one, Dude….. But hey, if it’s one thing I can count on besides seeing the sun rise in the east, and stars being born and dying, is that I can fire up Leeham News and check out the comments for some good old-fashioned Airbus fanboys’ commentary. Let’s see how this unfolds. I predict the 280t -900 will be the ultra long range work horse. I also predict the A350-8000 as well as a higher payload -1000 will be launched. I agree that Boeing should NOT have gone with the current method for building the B77X. That being said, I don’t think Boeing needed to even go with a composite for the B77X either. “Next generation” Al would’ve probably lowered weight by 7%-9% and would’ve made the B77X a phenomenal plane. While risks would’ve increased somewhat, it would not have been anywhere near the risks of building a composite aircraft. I think the current 10-across for Y is fine especially given that Boeing is going to be able to free up some insulation space. Regarding the fact that the B77X will become a “commercial” failure ala A345/A346, the A345/346 sold only 131 frames while the B77X has already sold 300+ frames. Thanks for the link. I did a quick read and it was very interesting and enlightening. Regarding your question, I’m not so sure if I understand it completely but I don’t recall Boeing really changing the metal/metal-composite for the B77X at all (compared to the current generation B777) and I do remember that they wanted to take a “low-risk” approach to the B77X (an asinine move IMHO). Of course Boeing will probably make some “tweaks” but the major metal structure will not be changed too much. Unless Boeing make some strategic changes, I don’t see the B77X as competitive as it should be. My reply was mostly about the ( IMHO unachievable) weight reduction you attached to changing just the fuselage to Al-Li. My guess is that you will not exceed a 3% MEW reduction. I read a briefing from Alcoa regarding their next-gen aluminum. I think it was Al-Li and it certainly stated that they were able to reduce fuselage weight by about 10% so I was being a bit cautious on the numbers. IIRC, it was for a single-isle fuselage but applicable for twin-isle fuselages as well. Airbus (and the trade press) needs to watch its terminology. An interior with business, economy, and premium economy is not a true tri-class. For that one needs a first class section, with its heavy seats/suites, lavs, and amenities (food & drink). Removing first class and adding premium economy makes the configuration a two-class configuration. Some folks call it two-and-a-half class, but they are just joking around. Boeing employee, maybe in Boeings 1996 reference guide. In the real world, A359/789 have no First (Qatar, Vietnam, Finnair, Singapore Airlines) these days. I think it would be fair and upfront if Boeing stops comparing 9 abreast 787 and 10 abreast 777 seat plans with Airbus A330, A350 and A380 economy class on a one to one basis. It just isn’t the same in the real world. Check any trip reports around. We could say that one inch wider seats equals two inches greater pitch. That would give a similar space per passenger, one optimized for slim and tall, the other for short and muscular. Airbus A350 economy class with 18″ wide seats at 31″ pinch, is the same as Boeing 787 with 17″ wide seats at 33″ pinch. Pitch depends on the airline, width not so much. Qatar’s 787 Y seats are awful either way compared to their A350 Y seats. Very few airlines offer 33″ pitch in any longhaul main coach cabin (JAL is to be commended for their bucking the trend). It may be the other way round. Boeing figures used to be based on configurations that were old. They appear to have corrected them. But we will see! My best example though is GE who continue to suggest that their sfc for GENX is the best. Operations suggest different. This brings me to the GE9X. 5% better than the Trent XWB? Seriously! My understanding is that GE is up to par while RR is still trying to recover. something about an all new engine RR calls the TrentTen? I do not think there has been any confirmation as to whether the 777-9 will have aluminum lithium fuselage. Speculation is that the weight reductions achieved in the design specs suggest a switch to aluminum lithium fuselage. I don’t recall any switch either. Do they pay Airbus more if they super size the fuel system? How can you change the intakes on a fixed design? Odd. Lower, more risk of ingestion of crud in the bottom of the tank. aircraft are priced per value. More fuel means more value means higher price as does MTOW. The fuel tanks (=sealed wingbox) have the size for 165kl on all A350, the cut off is placed differently and there was some plumbing that had to be modified for the URL volume. The flexibility of MTOW and range (from Regional to ULR) offered by the A350 is for sure something of big interest for Emirates. The 777-X may end up a la A380!